India entered this game with a 2-1 lead in the series despite the failures of their opening duo of Shikhar Dhawan and Rohit Sharma. Just when the whispers about their failures started to gain momentum, the dynamic duo silenced critics with a magnificent performance in the fourth ODI. While Rohit fell short of a century by 5 runs, his opening partner Dhawan went on to score 143 off just 115 balls. India had made four changes to the side for this match - KL Rahul came in for Ambati Rayudu, Rishabh Pant for MS Dhoni, Bhuvneshwar Kumar for Mohammed Shami, and Yuzvendra Chahal for Ravindra Jadeja - after choosing to bat first. While a few expected KL Rahul to open the innings, the team management stuck with the experienced pairing of Rohit and Dhawan and were duly rewarded. In the first powerplay, the duo added 58 runs to give their side a fantastic start on a belter of a pitch in Mohali. They did not stop there and went onto stitch a century partnership for the fifteenth time in ODIs. 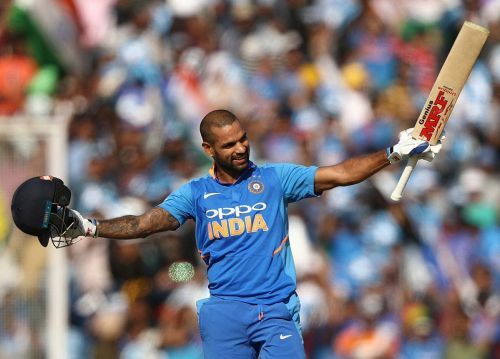 Dhawan was the faster of the two batsmen to reach the half-century mark but Rohit looked like he was going to beat his partner in the race to 100. Just when Rohit seemed to be cruising towards a century, Jhye Richardson sent him back to the pavilion five runs short. As a result, the huge 193-run partnership between Rohit and Dhawan came to an end in the 31st over. Even after Rohit's dismissal, Dhawan looked in ominous touch and went on to make his highest ODI score. Just when the southpaw was trying to up the ante, he was dismissed by Australia's best bowler on the day, Pat Cummins, who ended up taking 5 wickets in the match. After Dhawan's wicket, India could never gain that momentum again, but crucial cameos from Rishabh Pant and Vijay Shankar ensured that they posted 358 at the end of 50 overs. Jasprit Bumrah, the best ODI bowler in the world, also did his bit with the bat by hitting a six off the last ball of the innings against Cummins. Shikhar Dhawan was never a concern. People just get too excited. He is undroppable from this Indian ODI team. JASPRIT BUMRAH HAS HIT A SIX! I HAVE SEEN THE BEST MOMENT IN 2019 ALREADY! Bumrah is the best bet in death overs, in both the innings. He can anchor at 4. He can finish games at 7. He can win games by bowling the last over. 4th ODI: Asked to finish an innings, batted aggressively & selflessly for a 26(15) cameo! Vijay Shankar sealing that WC spot! That hug between Rohit and Dhawan spoke a lot about thier camaradarie. Jeez. Our team looks million dollars when Dhawan & Rohit come to the party.